The easiest most reliable way to create, amend, search, archive, and report title and escrow quotes. EscroWizard's intuitive interface makes it easy to generate quotes for your customers. In fact, a quote can be emailed to a lender within minutes of answering your lender's phone call. By simply selecting your current products, and filling out the lender and property information, your employees can have your quote in your lender's inbox by the time they hang up the phone, and you can safely send your quotes knowing your quote is accurate, easily complying with all RESPA regulations. Keeping costs down is important in any business, including yours. 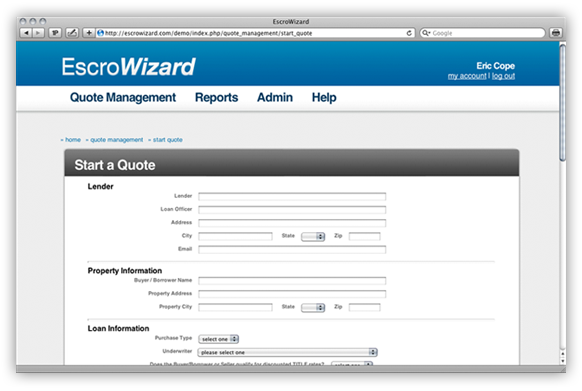 EscroWizard will enable your company to offer more quotes quicker due to its automatic web interface. Quotes will be more accurate with fewer errors requiring fewer amendments and less time of your employees'. Every moment you save fixing errors can be used to quote new business and improve customer service.